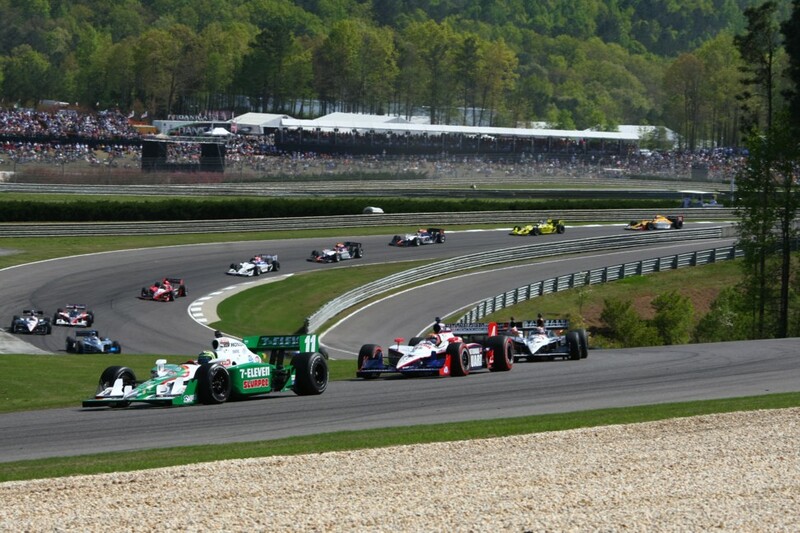 Spending the first two races confided within the urban-cented temporary street courses, the 2010 IZOD IndyCar Series tour races at the picturesque nature landscape of one of Alabama's newest racing locales Barber Motorsport Park for a 90 lap affair at Barber Motorsport Park. With an estimated 50,000 fan in attendance for the inaugural IZOD IndyCar race at the Barber Motorsports Park (mentioned by the track owner as doubled the attendance of any other race event held at the venue), NBA great Charles Barkley presided as grand marshal to officially start the Indy Grand Prix of Alabama. As the green flag flew in the air, pole sitter Will Power surged forward to lead the first competitive laps around the road course for the series. Starting 5th in the field, Scott Dixon launch in his #9 Target/Chip Ganassi Racing car up to 3rd place came under suspicious of the IndyCar officials. 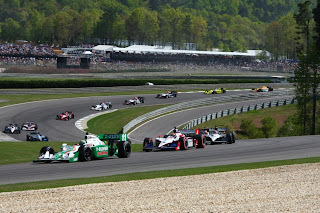 Judged to have passed cars prior to the start line, Dixon was required to surrender the two positions to Helio Castroneves and Marco Andretti. As the 25 Indy cars sailed around the 2.38 mile road course, long straightaways and winding high-speed corners left a minimum of overtaking opportunities for the competitors. Some teams elected to pit early in an attempt to set them on a different pit strategy. By pitting early for tires and fuel, drivers will take advantage of open race track where they can run fast laps without interference from other cars. In the case of the Indy Grand Prix of Alabama, the caution came out shortly after those pit stops for a powerless #25 KV Racing Technology car of Takuma Sato. Found to be a broken throttle cable by engineers, Sato eventually rejoined the race. As the #25 car avoided retirement, the 90 lap distance ended with every competitor running. Under the caution, the leading #12 car of Will Power and second-place Mike Conway in the #24 Dreyer & Reinbold Racing car pitted along with Penske's Ryan Briscoe as well as the #22 of Justin Wilson. Along with drivers who had previously made pit stops, 3rd place Helio Castroneves and the #26 Andretti Autosport Venom Energy car of Marco Andretti remained on track taking the top-2 spots. The turn 5 hairpin represented the only true quality passing opportunity for drivers to advance their positions. On lap 15, Marco Andretti made a pass on Helio Castroneves through that corner using his Honda engine's available power boost twice to complete the move. Andretti's overtaking of the #3 Verizon-sponsored Penske Racing car would prove to have serious implications for the race outcome as both drivers pushed to survive with only a two pit stop strategy. Pitting on lap 29, Andretti briefly handed the lead to Castroneves until the #3 Penske Racing car pitted 2 laps later. As the laps ticked away and many drivers held station, big questions surrounded whether the #26 Venom Energy car of Marco Andretti could make after his second pit stop on lap 57. While Andretti cycled back to the lead, Castroneves' #3 car maintained a hot pursuit aided by a possible attempt by Andretti to save fuel. Ultimately, the two-stop plan for the #26 car could not work as Marco Andretti regrettably brought his car to pit road on lap 82. Andretti came out at pit road exit in 5th place as Helio Castroneves stormed away from newly-promoted to 2n place runner Scott Dixon. In two laps, the #3 car of Castroneves more than doubled the interval back to the #9 Target/Chip Ganassi Racing car which was 2.4 seconds on lap 85. Despite a final late race caution flying after Simona de Silvestro's #78 Team Stargate Worlds/HVM car spun and stalled on the turn 5 hairpin, Dixon didn't have the pace nor the passing opportunity to challenge Helio Castroneves on the final two green laps. Helio Castroneves' first race since the Texas round last season, a trademark fence climb and an embrace with his three-month old daughter accompanied the Brazilian's celebration. 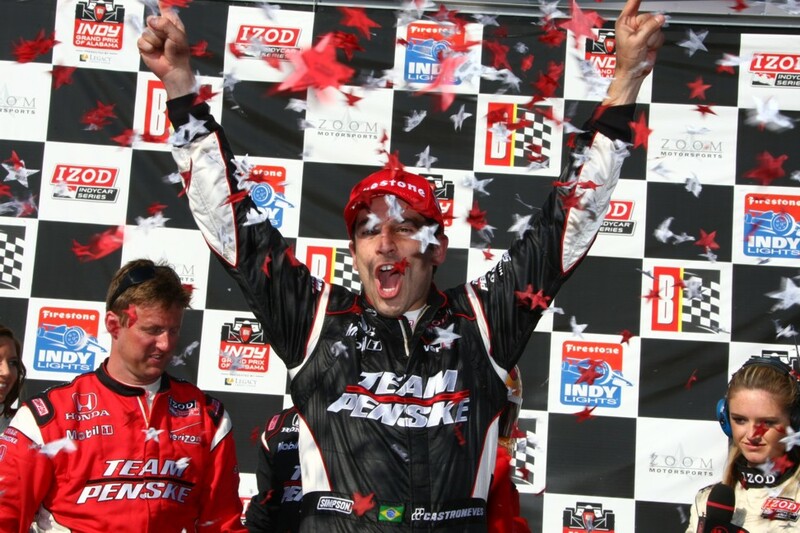 Commenting in post race, Helio Castroneves conveyed his confidence that helped me this victory possible. "I felt like the Team Penske car was better than Marco's but, unfortunately, I just couldn't pass him. I was just patient and waiting for an opportunity, and well, I guess we were able to be smart enough to save a lot of fuel. Towards the end, we just had a yellow flag. I didn't ask for that." Deeper into post race interviews, Castroneves jokingly boasted about taking the power away from his teammate Will Power. Power finished 4th overall in the 2010 Indy Grand Prix of Alabama, missing out on becoming the first IndyCar driver to win 3 straight races to begin a season. While Power lost, Verizon Penske Racing still enjoyed Castroneves' victory in the #3 car as extending the team steak to 3 races for the 2010 IZOD IndyCar season. Finishing 2nd, Scott Dixon kept dwelling on the first lap start. "I feel that the officials made a poor call when they said that I passed Helio at the start/finish line. I got back behind him and he went around the outside at Turn 1." Dixon responded in post race comments. Behind a slightly disturbed Dixon, Dario Franchitti climbed to a 3rd place and final podium position at Barber Motorsports Park. Making it two of the first three races he led in 2010, Marco Andretti spent a considerably longer time out in front at Barber Motorsport Park than he did in St Petersburg. Despite losing out to a daring fuel gamble, the entire #26 Andretti Autosport team endured to finish a strong 5th place. (I would like to believe that the interview he gave me for XSL Speed Reporter also contributed but I'm pretty sure I'm overselling my role). With limited in passing opportunities, some IndyCar drivers were able to gain an advantage through the help of their pit crews. Starting 21st after being short on speed through the Saturday qualifying session, Alex Tagliani and his FAZZT Race Team pitted the #77 car early in order to "We made up 11 spots so I take my hat off to the team. They did a good job." Using the same strategy, Panther Racing's #4 car of Dan Wheldon shot up the most positions of any driver in the Indy Grand Prix of Alabama by leapfrogging up 12 places to finish 11th. A race not matching the carnage of the Sao Paulo Indy or the Honda Grand Prix of St Petersburg, the inaugural Indy Grand Prix of Alabama wrapped lacking a certain desired excitement. The 2010 IZOD IndyCar Series tour returns to street course racing at Long Beach next week (April 18th).